Carrying a revolver means you pack extra ammo. Five or six shots may solve your immediate problem, but without ammo to reload you’re unprepared for anything else that might kick up. 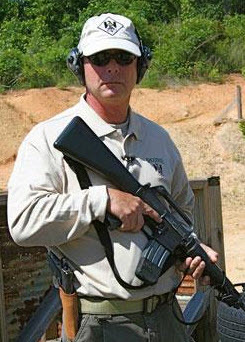 How you carry ammo and the gear used is just as important as your tactics and training. For semi-auto pistols you carry extra magazines. 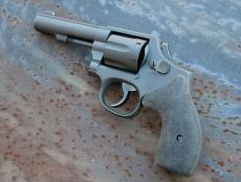 With a revolver there are ways to carry loose rounds, speed strips, and speed loaders. Shoving a handful of rounds into your pants pocket is not advised. The ammo should be located and positioned in a consistent manner so you can get to it efficiently from any position. Below are a few things that work well for me. Your application, personal preference, or how you have to dress dictates how your carry. I’m a big fan of pouches and carriers for the belt. I’m don’t carry ammo in a pocket. Your body position in a fight may not allow quick access to a pocket. 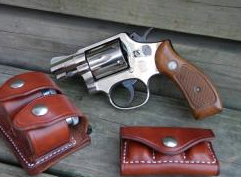 I like it on my belt, and the ability to grab one or two rounds for tactical reloads – replacing rounds fired with live ammo -an essential skill for the revolver. There are lots of options for belt carry. 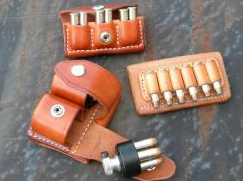 The two I use most often are an old six round slide loop carrier from Milt Sparks and a pouch El Paso Leather calls a “2-6 Pick Box,” which hold six rounds in three separate compartments. Both of these allow you to carry extra ammo in a fairly concealable manner with quick access. I’ve tried speed strips, which are like metal stripper clips for ammo except made of rubber so you can strip rounds off once they are chambered. They are a good way to carry ammo, but for me they are difficult to carry and my old hands don’t work with them very well. If you do carry strips they should be inside a pouch. You can put a strip in your pocket, but over time the rounds will twist loose and attract lint and grime like a magnet. Speed loaders are almost like carrying a magazine, it just takes a little more skill to work them. With a revolver if you’ve fired until empty, or shot four out of the six rounds it holds, dumping everything and loading all six chambers fresh is the way to go. This is the job of the speed loader. The disadvantage is they are bulky, making them more difficult to conceal. I use El Paso Leather’s Double Speed Loader pouch. The key with revolvers, as with all weapons, is learning how to operate them and the related gear. This process takes a little more time and research because there are several options for manipulating revolvers, like keeping it in the strong hand to manipulate or swapping it over to the support hand. There are also a variety of ways to carry ammo. Once you determine what works well for you then make time for plenty of practice. Scottsboro Gun & Pawn (256-259-0693) is the “Cheers” of gun shops located near my home. They know everyone worth knowing, you can catch up on all the latest happenings, and they never fail to have some very nice revolvers on the shelves, both Smiths and Colts. I would like to visit more often, but it’s like every time I stop by there’s another “must-have” pistol capturing my attention. My most recent purchase is a Smith & Wesson Model 12 -3. I didn’t really know what it was when I saw it in the display case, I just knew it wasn’t something uncommon. Plus, it had a really nice nickel finish, which would fit well with my other shiny S&W K frames. Research revealed that the Model 12, introduced in the 1950’s, is basically the same as the .38 Spl K frame Military & Police Model 10 except the 12’s frame is made from a strong aluminum alloy, a “new” material at that time developed during WWII. The first models had an alloy cylinder as well, but this was changed to steel after it was discovered to crack, even using a special low-pressure .38 cartridge known as the M41. Early 12’s have a frame that is .080″ thinner than standard K frames but the 12-4, 1984, has a standard width frame allowing it to use standard K frame internals and grips. The Model 12 came in round and square butts, blued and nickel, and in 2″ and 4″ inch barrels. According to the Standard Catalog of Smith & Wesson, 3rd Edition, 5″ and 6″ barrels were cataloged, but are not to be found. The model was discontinued in 1986. I occasionally buy firearms because they are rare or models that I have strong attraction to, but most of my weapons do see carry and use. At a minimum I want to know that they will actually shoot. If it won’t function reliably what you have is a sculpture of a firearm, a non-firing replica. I also want to make sure it’s zeroed, or in the case of non-adjustable sights any variation between point-of-aim and point-of-impact noted. Any firearm I own can be retrieved, loaded if needed, and used in defense against a threat. Because of my job I don’t carry revolvers as much as the 1911, but for defensive use I’ve never felt under-armed, especially with the .357 magnums and the ability to reload. 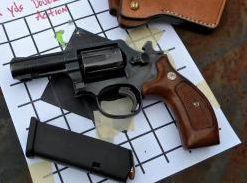 Should you decide to carry a revolver you are going to have to practice with a revolver. Don’t train/practice exclusively with a semi-auto, “because that’s what everyone else is shooting,” when all you carry is a revolver. Choosing two different type weapons means you’ll need to practice twice as much to be efficient with both, otherwise you’re better off picking one and being the best you can with it. I have some firearms that don’t get fired often, and some “Sunday-go-to-meeting” pistols worn for special occasions such as weddings and such. But, if necessary, all of ’em will fight.